When we first started using WindowMaker, we saw very few elements on the screen. The most prominent of these is the background. Like everything else in WindowMaker, the background can be changed. What you see here is the default background for WindowMaker as installed from Synaptic. This is the same wallpaper that is the default wallpaper for the original PCLinuxOS variant (with the KDE desktop), and for the MiniMe KDE version. WindowMaker has five types of backgrounds, namely solid color, pixmap, gradient, textured gradient, and interwoven gradient. The only configurable option here is a solid background color. The PCLinuxOS implementation defaults to solid white. Standard wallpapers are displayed with this type of background. XPM, XBM, PNG, TIFF and JPEG files are supported here. This type of background allows you to create gradients of any number of colors. Options here are horizontal, vertical or diagonal gradient, and the gradient rendered starts with the first color on the list, transitioning to the next color, and the next until the end of the list is reached. The default PCLinuxOS installation provides a horizontal gradient starting at yellow, and transitioning to blue using only yellow and blue for colors. This type of background layers a two color gradient with a horizontal, vertical or diagonal option on top of a pixmap. Like the Pixmap type, XPM, XBM, PNG, TIFF and JPEG files are supported. However, graphics used are tiled only, rather than scaled. This type of background was designed to be used with graphics that are textures, rather than photographs. Also, gradients are limited to exactly two colors. The other configurable option is the opacity of the gradient layered on the textured graphic. This type of background superimposes one two color vertical gradient on top of another two color vertical gradient. The gradients are rendered with alternating rows of pixels on the background. That is, the first gradient renders the first, third, fifth, etc rows while the second gradient renders the second, fourth, sixth, etc. rows. 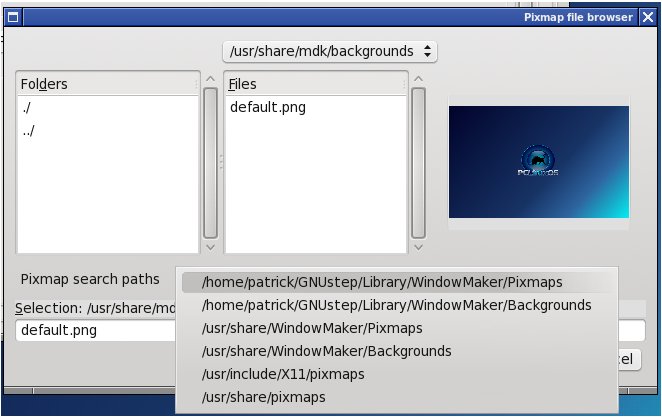 For WindowMaker to use pixmaps, WindowMaker has to be able to find where these graphics are located on your PCLinuxOS installation. This list can be modified either through the WindowMaker Configuration Manager, or through the WindowMaker preferences utility (accessible by double clicking on the GNUstep icon on the dock itself, which should be on the upper right corner of your screen). The first two items on the list are located in your user home directory. The other three items on the list are pixmaps and backgrounds accessible to all users the machine where you installed PCLinuxOS, hence the /usr/share prefix. To install wallpapers for your use, simply copy them to the GNUStep/Library/WindowMaker/Pixmaps or GNUStep/Library/WindowMaker/Backgrounds directory within your user account. Of course, you can use any background anywhere in your user space, but this directory is where WindowMaker looks for backgrounds by default. I will show you why in the next section. Like most everything else in WindowMaker, the background can be changed. The easiest way to do this is by right clicking on the background, then selecting More Applications → Configuration → WindowMaker Configuration Managerfrom the popup menu. Like KDE and GNOME, WindowMaker comes with four desktops, called Workspaces. In the last article on icons, and the article before that on the basics, I mentioned a Clip on the upper left hand of the screen. The clip is used to change which desktop is displayed. 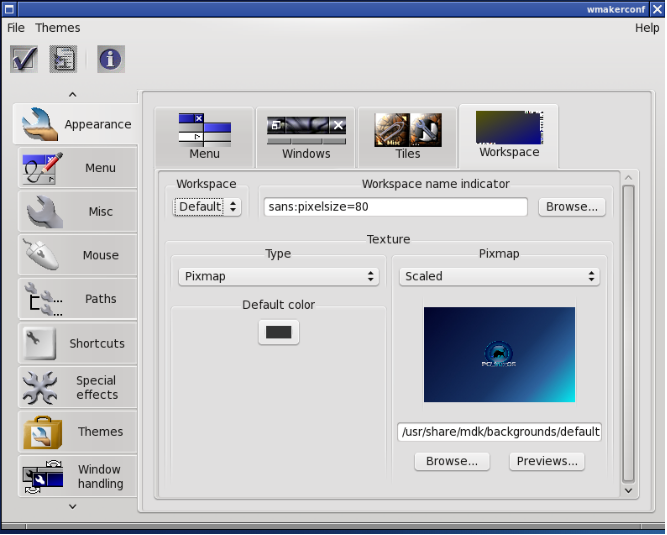 Click on Workspace to get the settings shown here. By default, you can change the background for all four workspaces. The Workspace pulldown menu allows you to select which workspace you would like to apply your background. The Pixmap menu allows you to center, tile or scale your graphic to be displayed. The Default Color button (with a sample on the button) is what WindowMaker uses to fill in any space not taken up by the graphic. This is generally the case with graphics that are centered, or scaled retaining the ratio of the graphic. There are two options for scaling graphics. The first automatically stretches the graphic to fit to the screen resolution. The other option retains the original shape of the graphic. 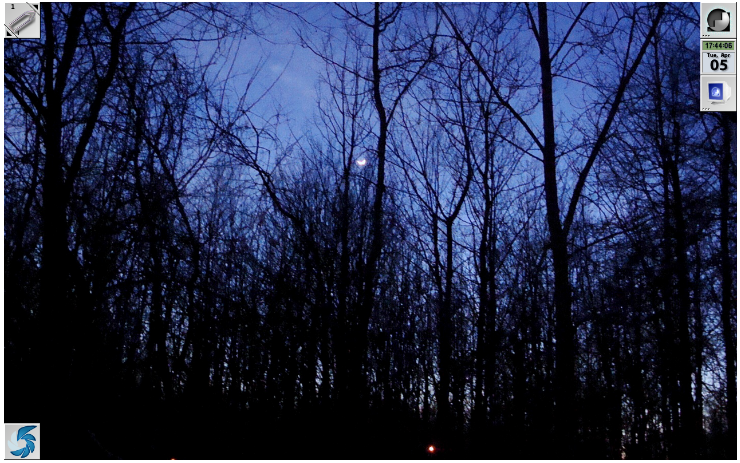 To select a graphic to use as wallpaper, click on Browse... and a dialog will appear allowing you to select the graphic. 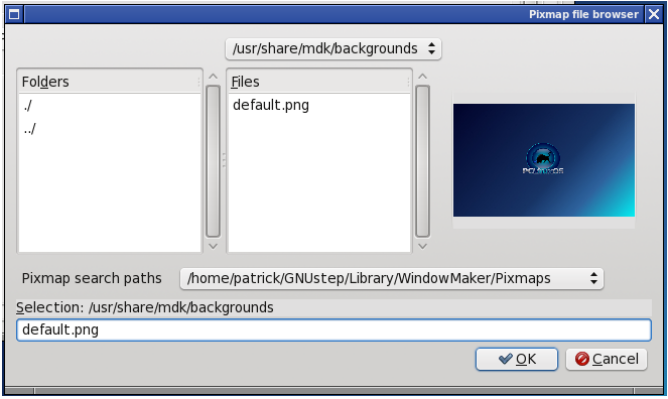 When you first open this dialog box, the contents of the /usr/share/mdk/backgrounds directory are displayed. 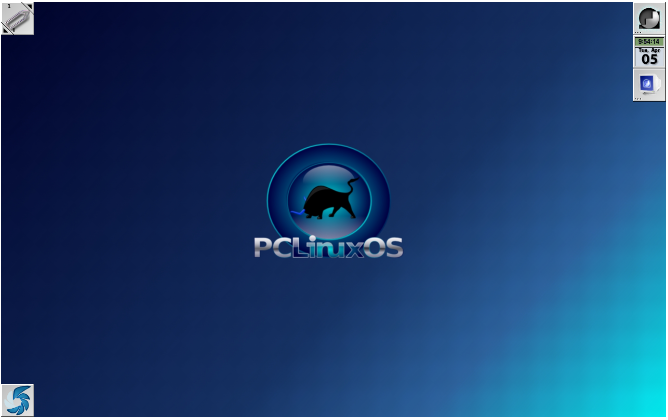 This is the default for PCLinuxOS, and only the standard PCLinuxOS background is showing. Like other file selection dialogs, you can change the directory to where your wallpaper files are stored. Notice that the dropdown menu next to Pixmap search paths shows the GNUStep/Library/WindowMaker/Pixmaps directory within your user space. Clicking on this dropdown menu will pull the list of directories WindowMaker uses to search for wallpapers. Select one of these directories to change to that directory. Any supported graphics files found will be displayed under Files. As you select, the preview of that graphic will show up on the right side of this dialog box. Click on OK to select the graphic. You should return to WindowMaker Configuration Manager. The new graphic should be displayed in the preview. Then click on the Checkmark (on the upper-left hand corner of the Manager window below the menu. This will exit the configuration utility and apply the wallpaper to the Workspace as shown below. There are many places on the Web where you can download and use wallpapers. Downloads page on my website. Of course, there are many other sources where photographs can be obtained. In fact, there are many sites devoted to providing only wallpaper images. Just be sure you have the right to use the images as wallpaper before downloading.